Anyone running a wholesale or retail business must deal with legal and tax issues, and those who sell on eBay are no exception. Yet many eBay sellers remain ignorant of the consequences they may face if they disregard certain basic rules. Anyone running a wholesale or retail business must deal with legal and tax issues, and those who sell on eBay are no exception. Yet many eBay sellers remain ignorant of the consequences they may face if they disregard certain basic rules. 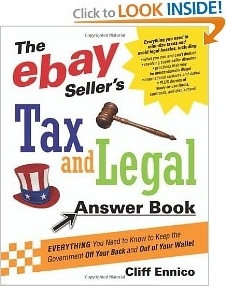 Packed with stories of actual eBay sellers, this helpful guide takes readers through the most common eBay transactions, pointing out all the legal and tax issues they may encounter along the way. D. Flowers of Harrison, AR says, "Cliff Ennico has written this book to be not only packed full of great legal information and tips, but his humor throughout the book made it fun to read. I am so glad I bought this book before I got too far into ebay (or any other online selling) because it answered so many of my questions regarding tax issues. Buy it, use it, and keep it handy! Definitely worth every penny paid! o Is This Really a Business? o Aw, Do I Hafta Pay Taxes? Paul A. Mcmahon says, "This is a great book written by an attorney who has a sense of humor who can have you laughing while you are realizing that the tax collector has his hands in your pocket. The writing is crisp and to the point. It is well organized and indexed so you can find something you need to know when you need it.